Aiming to enhance your business efficiency, easy pdf to image is packed with various convenient features, allowing you to convert varied pdf files to image format with minimum consumption of time. With easy pdf to image, you can easily convert pdf to png, tiff, jpeg, even doc file, and you will find it can t be easier to convert pdf to image. Easy pdf to image is packed with various flexible features, allowing user to perform the task of converting as per requirement. There are 3 different mode selectable to run converting, and multiple output formats are supported, you can deal with your pdf files actually as your specific requirement. 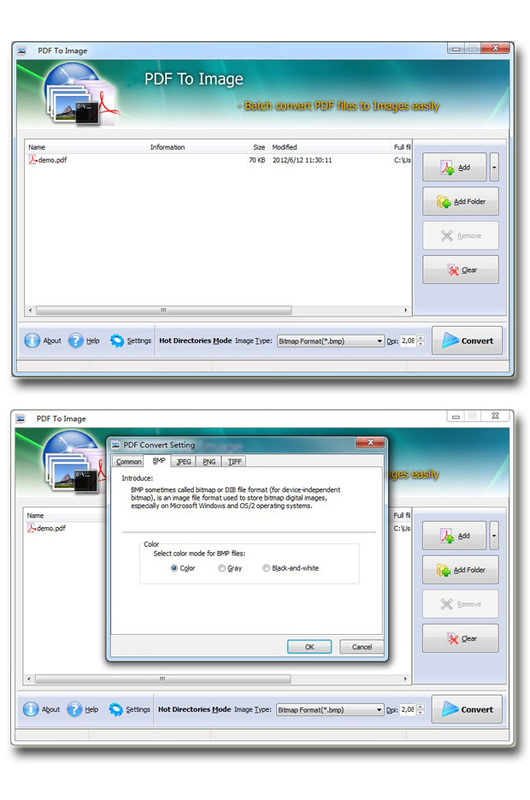 Easy PDF to Image is a business program that works under windows xp, windows vista and windows 7. It supports both 32-bit & 64-bit windows editions, therefore it could run faster on 64-bit computers. Estimated download time for Easy PDF to Image on a common adsl connection is less than a minute. Version 1.5 was released two thousand one hundred ninety one days ago by Easy PDF Tools Ltd.. Click the green download button to download it now.